New Year’s Eve is such a festive time of the year! We like to stay in on New Year’s Eve to avoid some of the craziness of the night. Typically, we like to host neighbors so it is easy for everyone to get home safely. It was so much fun putting this gold and silver table setting together for this special occasion. Actually, once I finished up taking the photos I realized that the centerpiece and place settings would also be suitable for a Christmas celebration or even a birthday dinner! Working so hard to design and install all the Christmas decorations each year, I usually keep most of them up through the new year so we can enjoy them. Occasionally, I remove some of them gradually after Christmas, but the Christmas trees certainly don’t come down until after the first of the year. Actually, some of the ornaments used in this centerpiece were re-purposed from the tree already sitting in our main dining room. The tree has a few open spots in it now but still looks nice enough. Since we all are typically hemorrhaging money at this time of year, I didn’t want to spend more to create this table setting. As I mentioned, I literally pulled ornaments and the glass balls straight off the Christmas tree and placed them around the flowers arrangements. I also used some of the ornaments from the Winter Glam Dining Room Table Setting (shown here) I created for the holidays. Re-purpose, recycle and re-use!! No new items were purchased for this centerpiece, except for the fresh flowers. Plus, I already had bought the grey hurricanes for the Rustic Winter Christmas Table Setting (shown here) I put together for our main breakfast room. For the floral arrangements, I bought $30 worth of fresh flowers from my local grocery store and created five arrangements (in a variety of sizes) for the centerpiece. It will be nice to disperse them throughout my home once the night is over! Utilizing different size containers for the flowers, a variety of sizes of candle holders and accessories really adds nice texture and balance to a centerpiece. Actually, the two smallest containers for the arrangements are votive holders. Be creative! For these place settings, it all started with these gorgeous gold placemats that I stumbled onto at HomeGoods a couple of months ago. They were modern, fun and a bit dressy, which is exactly what I was looking for. After all…New Year’s Eve is a very special night! Any gold, cream, silver or white placemat that you might have would work just as well! Just mix up the silver and golds pieces. Because this New Year’s Eve dinner party is a special occasion, I chose to use my Lenox Eternal Dinner Plates that I’ve had since I got married. Fortunately, my mother has the same pattern, so between the two of us, we have quite a collection. It is so nice to be able to borrow more when I need it for larger parties! Since the placemats and the plates were gold, splitting up the two with a silver beaded chargers seemed to be a good idea. These fantastic Small Print Gold Napkins are from Wisteria and just arrived a few days ago. I just love them!! They also come in silver, so you could easily switch this all up. Some more of my HomeGoods finds for this table included the silver glitter salad plates, the napkin rings, and the grey glass hurricanes. Luckily, there is a HomeGoods store about 45 seconds from my home! Not so lucky though for my husband!! The simple grey wine glasses are a favorite of mine! I found them at Cost Plus World Market and used them a lot throughout this season. They are a great staple, inexpensive and provide extra interest to the table! Creating beautiful table settings is not only an artistic outlet for me but also a labor of love. It is all in the details and personal touches with the intention to make our guests feel comfortable and appreciated. 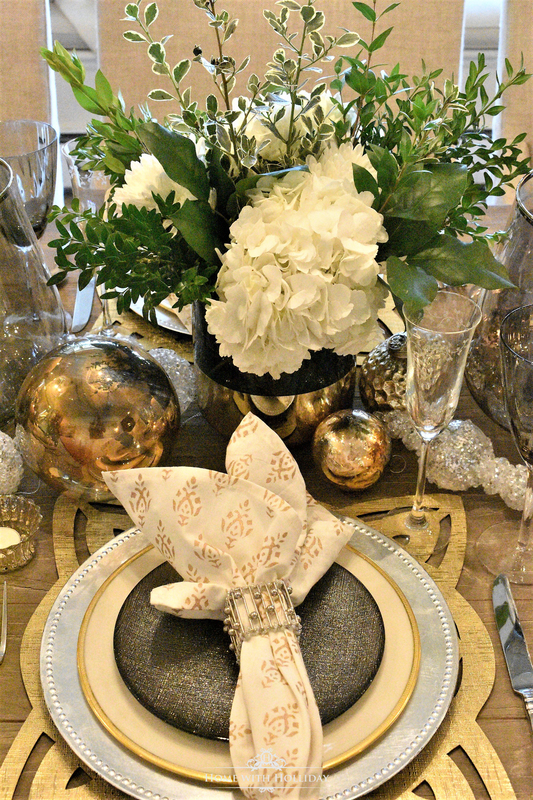 Hopefully, the Gold and Silver Table Setting inspired you for your next Christmas or New Year’s Eve celebration…or even a special birthday or anniversary. It is hard to believe this is my last post of this year! Starting this blog a few months ago has been such a journey, both in terms of the learning experience and growth for me personally. Unfortunately, my family doesn’t quite understand why I am on my laptop ALL DAY EVERY DAY, but maybe someday they will. I am so appreciative of our readers and hope that I have been able to provide a bit of inspiration and useful ideas. Coming into a new year is such an exciting time! It is the time of year to reflect on milestones and events of the past year and consider the plans, goals, and dreams of the new year. I hope that this coming year holds the very best for you and your family! For more inspiration, you can go to my Pinterest page for thousands of pins of Christmas Decor, Christmas Trees, Christmas Table Settings and ideas for New Year’s Eve. I like the mix of silver and gold, especially with the color of the wood table. The use of non Christmas tree greenery reminds me that Spring is next – !it’s a happy table – please hurry spring! Thank you! I am also ready for spring! Happy New Year! Love all your creative and inexpensive ideas to decorate when I entertain. Proof that I don’t need to spend a ton of money to have it look fabulous (& I can reuse and repurpose my items on other themed tables throughout the year! I appreciate the links you provide if I want to purchase any of the inspiration items, as well! Thank you so much for your kind words Deb! I am so glad you are enjoying the blog!! Happy New Year!